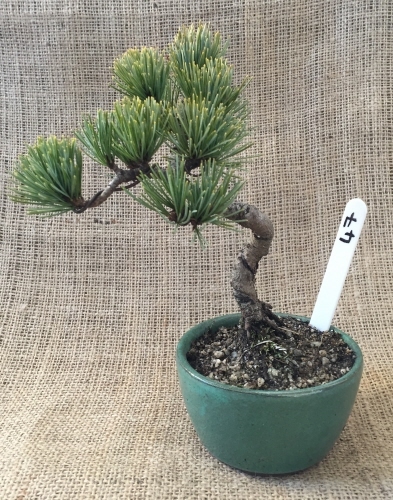 A beautiful Japanese White Pine (Pinus Parviflora) bonsai tree. One of the most popular evergreen species to be used as bonsai. This tree was imported from Japan and is very healthy and growing well. Ideal for shohin lovers or beginners to evergreens. JWP love lots of sun and prefer to be kept on the drier side. You should note that these little trees have had wire applied to the base of the trunk that has been allowed to grow into the bark of the tree. This causes the trunk to swell and creates interesting textures and shapes. This wire shouldn't be removed as it will make a mess of the trunk. The branches are also wired and this needs to be removed at an appropriate time and so you should be familiar with removing wire from bonsai trees before you buy this bonsai tree.